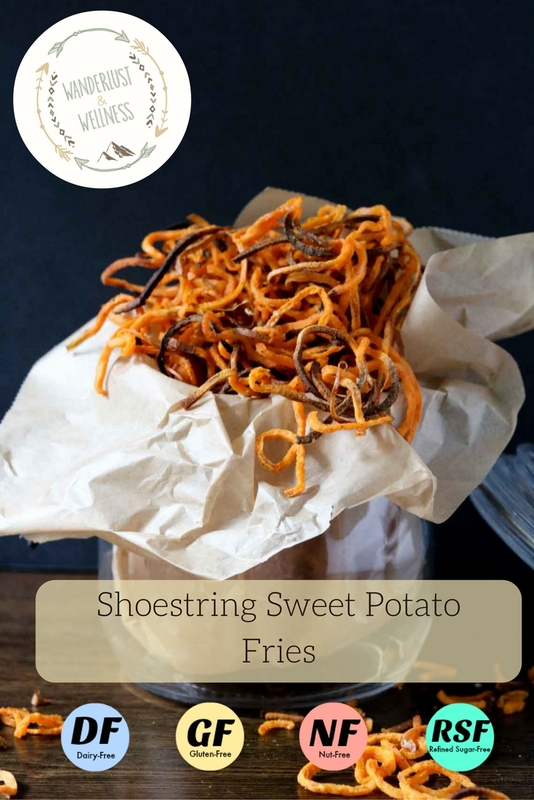 These shoestring sweet potato fries can be made in a snap with your spiralizer! Who knew you could do more than just make zoodles, right? And, the fact that they’re nice and thin makes them easy to crisp in the oven with some coconut oil, no frying needed. 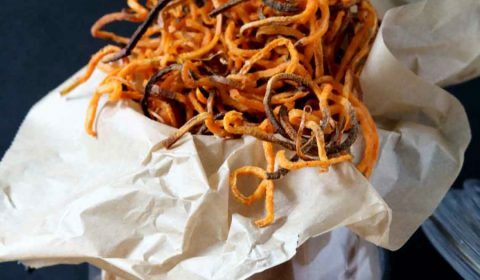 Bonus tip, leave the skin on the sweet potato before spiralizing because it will add some extra crisp to the fries. See guys, I’m always looking out for you! You guys know my history with sweet potatoes and how I absolutely used to loathe them. Someday I’ll stop telling you the backstory, but until then I’ll keep preaching. Sweet potatoes are full of good nutrients such as beta-carotene and Vitamin A. Not that their white potato counterpart is all that bad, but why not pack in as much nutrients per meal as possible? Give them a shot, they’re the perfect side dish for burgers. I even added in some Sriracha aioli for dipping sauce. Delicious! Cut both ends off of the sweet potatoes so you have a flat surface for the spiralizer. 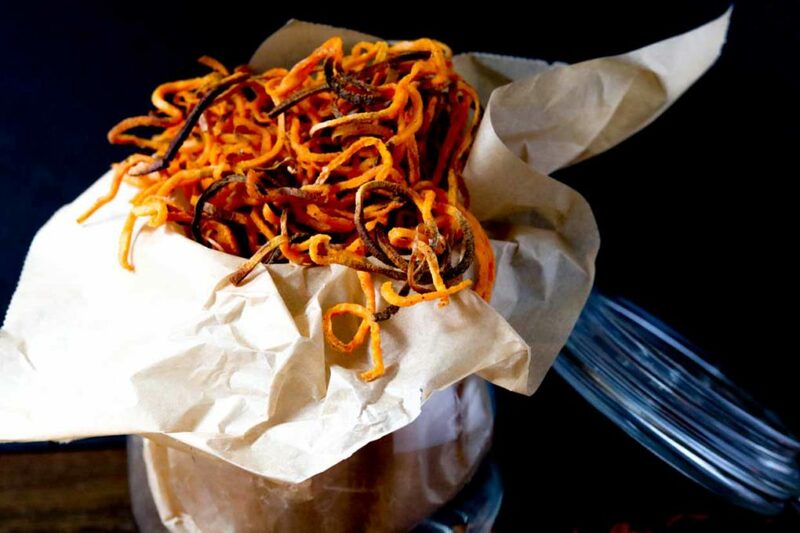 Spiralize both sweet potatoes and lay flat on a lined baking sheet. Melt the coconut oil and mix in the cayenne pepper. 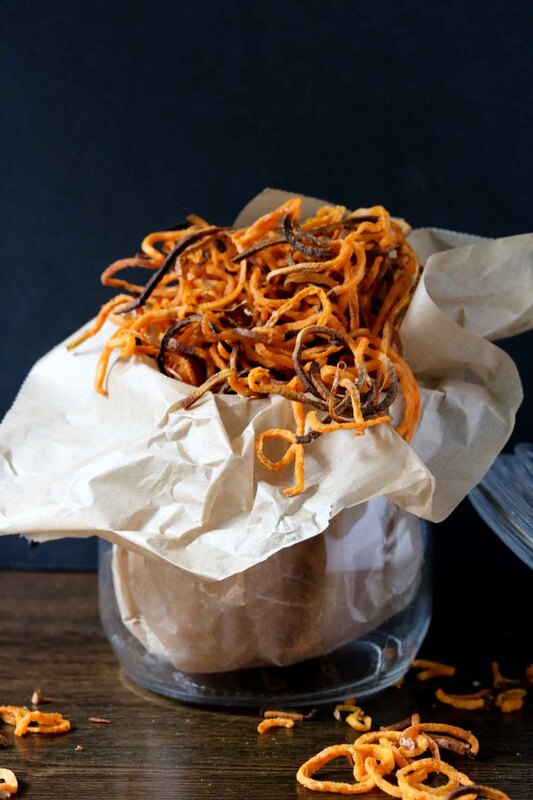 Brush over the sweet potato spirals. Add salt and pepper to taste and using hands gently toss the spirals to get them all well coated.